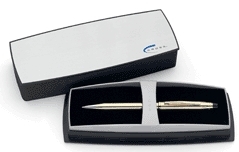 All of our Cross pens and writing instrument accessories can be imprinted with your company logoat our Cross factory. Click the link below to view the entire Cross Factory line. image proof with your logo and place order. Cross Townsend -- Influenced by our original art deco fountain pen of the 1930s, exemplifying the Cross legacy of design and engineering elegance. Cross Apogee -- Archival in inspiration, romantic in tradition, 21st century in design. Cross Century II -- Perfecting perfection. Our legendary classic evolved, updated, thoroughly of the moment. Cross ATX -- with a French accent. Bold, sweeping lines. A pure couture pleasure to have and hold. Cross Tech3 -- Three options in one clever multi-tasker. With a smooth twist, switch from a black ball-point to a red ball-point to pencil. 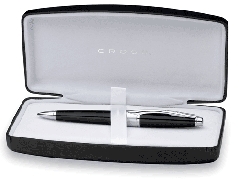 Classic Cross Century -- An icon of mid-century modern design, the Cross pen everyone knows and loves. Cross Aventura -- A refined profile combined with classic colors combine for timeless appeal. Cross Calais -- Reflecting Deco's embrace of geometry, handicraft, and streamlined form.